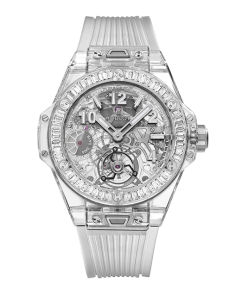 The novelty presented during Baselworld exposition of 2018, the Hublot Big Bang Unico Red Magic (reference: 411.CF.8513.RX) is limited with 500 pieces in the world. 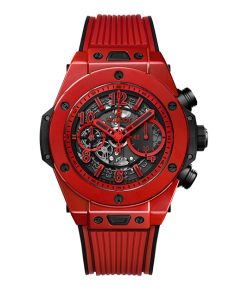 This new Big Bang Unico Red Magic catches the eye with the color red that characterizes it and named it. 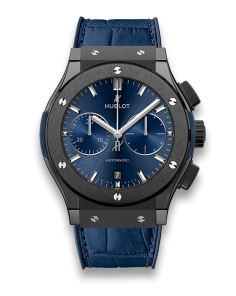 Through this model inspired by the Big Bang Ferrari Unico Carbon Red Ceramic (402.QF.0110.WR) Hublot once again express with technicality its capacity to innovate. 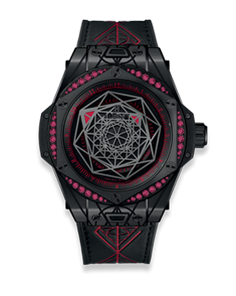 In 2018 Hublot presents to us a model, which the case has been entirely realised with red ceramic that we find inside as well as outside.